Playing around with my dream kitchen remodel tonight. I think I finally have a plan. It involves selling my stupid American "family size" refrigerator and gas range, along with much of my kitchenware (in the estate sale at which most of my other possessions will also be going on the block). That might get me enough money to buy the skinny fridge and the induction cooktop. Then I'll need to sell my one other valuable possession, the North Forty, aka half of my lot, to finance the rest. It's probably not the best use of my nest-egg, but I like thinking about it. I like the kitchen remodel! Does it include a microwave? I find that using one saves a lot of messing around with saucepans and washing up (I often eat out of the bowl in which I cooked precisely the portion which I need to eat), and food wastage (it's easier to estimate the correct portion). Are you selling the North Forty as building lots? How would those new houses affect your enjoyment of your home? I haven't had a microwave in years, but when I conceived the notion of a two-burner cooktop I realized that a microwave would take the place of a third burner for steaming vegetables and, yes, heating leftovers. I've discovered that there's a thing--microwave + convection--that is the size of a microwave and goes above the range like a built-in microwave, but also bakes with heat and convection. Technology, huh? So I can still indulge in some baking. I do like baking. But I don't need four cookie-sheets' worth of oven space. The North Forty is really only half of a standard "R5" city lot--i.e., originally zoned as a 5,000 square foot lot allowing only one residence to be built on it. The city has changed the zoning in my whole section of town to encourage greater density. I think the most that could be permitted on the 2500 square feet I'll be selling would be either a two- or three-unit rowhouse, but what seems to be going in all over the neighborhood are ungodly big single family houses. I won't have any say in it either way--though I think I can specify that the new construction will face away from my house. A house or houses on that half of the lot will spoil my view out the pair of windows you see at the right-hand end of my kitchen plan, so I'm already planning to have them replaced with privacy/quiet glass. The light will still be nice. It's a big change, but I've been thinking about it for so long that it's practically already real in my mind. I wish I had either a pantry or a broom closet, but I am not devoted to having Just Enough, so if I were I might not need both? Of course you can buy a separate cleaning gubbins for every imaginable possession, but you'll probably have just a broom, a mop, and a vacuum cleaner--which could be hung on a rack in the pantry. If you don't plan to bake a lot maybe a countertop convection oven instead of a "stove oven" and a microwave? The pantry is one of those very-skinny IKEA numbers with the pull-out vertical door--room for canned goods and maybe the iron and a recycling bin or something. But really, if I can't put tall things in it, maybe I don't need it. Hm... You make a good point. 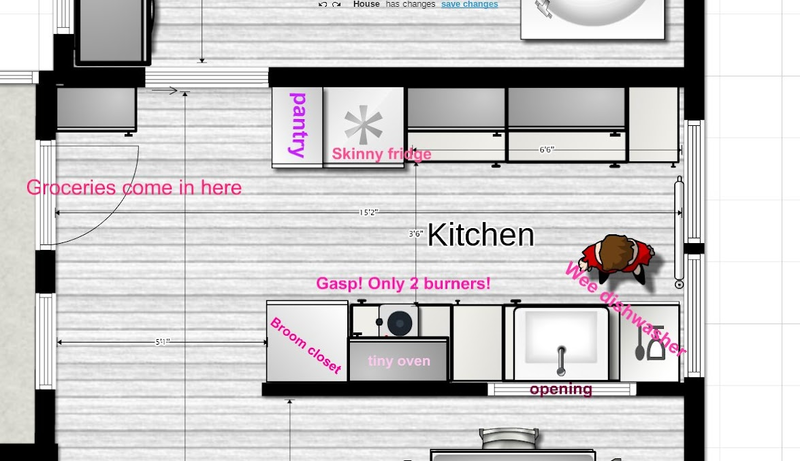 I'm planning a microwave+convection oven in the overhead space above the tiny two-burner cooktop. Apparently they have those now. Who knew? Nuke on one setting, bake on another. What a world. What will you do with the added space? It transfers directly to my living room, where all of a sudden I'll have room for a dinner table and a full-sized sleeper sofa.